Brittany Brees is known for her marriage to a football player called Drew Brees; he presently plays for the New Orleans Saints. The two have known each other for a long time and there is no separation them. Brittany Brees’ popularity is hinged upon her relationship with Drew, but she is a person who is big on philanthropy and firmly believes in giving back to her community. To learn more about the life and exploits of this woman who has a heart of gold, just keep reading. Who Exactly Is Brittany Brees – Drew Brees’ Wife? On the 18th of September in 1976, Kaithe and Pete Dudchenko gave birth to their daughter Brittany Middleton, her birth occurred in Syracuse, Indiana. Brittany had a very normal childhood as can be expected but because she is not the celebrity in her family the details of her life are not accessible or easily known by all. There is not much that is known about her life as a child, what is known is limited to where she was born and the names of her parents. However, it is known that she attended Purdue University which is where her relationship with the star football player, Drew Brees began. Their first meeting was at a party, both of them had recounted their experiences to ESPN the Magazine. Drew spoke about how the first day they met was plagued by his alcohol-induced boldness. This ruined any chances he had with her; it was not until months later at another party that he was able to talk to her. Brees had found out what party she might be attending, found a way to get into that party and this time asked her out properly. Brittany only agreed to go on the date on the grounds that her friends came along, as they were interested in knowing the guy who had goofed and ruined his chances the first time. Brees came along with friends of his as well and they all chose to go to the cinema. The couple started to date from that day until they got married in 2003, in the second month of the year. Brittany Dudchenko and Drew Brees have been married for more than a decade, in all that time the couple has given birth to four children, the first three children are boys while the last child is the only daughter they have. The name of their first child is Baylen and he was born six years after they got married in January of 2009; he has the same birthday as his father. Bowen, who is their second child, came a year after, in October of 2010 while the third child was born in 2012, his name is Callen. Their last child Rylen was born in 2014. In recent times, Brittany organized a party for Drew; it was in celebration of his 40th birthday and was a surprise for the footballer. The party was a glamorous one that had in attendance football stars and regular celebrities. Drew took to Instagram to thank his wife for the party. 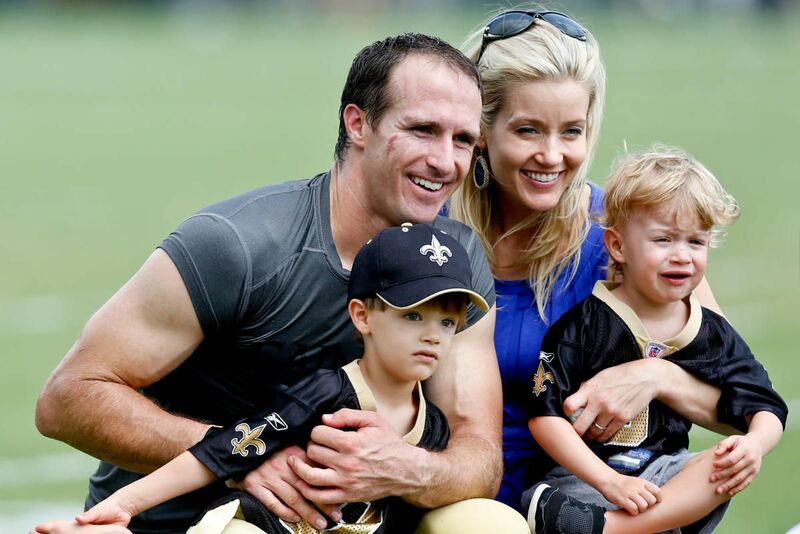 In 2006, the Brees moved to New Orleans where all their children were born. Drew had been signed by the New Orleans Saints, and they had to move. The move happened shortly after the disastrous Hurricane Katrina; the devastation that they met on ground triggered the couple to become fully committed to building up their immediate society. The first and only house they have lived in is in a neighborhood like any other, they chose to not live in the suburbs, and this action earned them more admiration of fans. Their commitment to the community is expressed in the ways they have offered help and continue to offer help. All of this is done with their foundation Brees Dream Foundation which although was created to provide financial support to cancer research, expanded to take-on projects that affect the victims of the hurricane and other projects that are particular to their community. Only recently, they had put lamps in a playground to help children who are handicapped. Their philanthropy has also extended to supporting charitable organizations in California and Indiana.